Does anyone have a source for the thermostat housing cover for a 76 280z? I just dodged a huge bullet when I was trying to change the thermostat and replace the gaskets. I broke off one of the bolts that held the cover, then tried to remove the entire housing and one of those bolts broke off as well. In the process of extracting the cover bolt, the easy-out expanded the bolt and cracked a corner of the cover. I was just now able to get the broken bolt out of the side of the head... I had to use vise grips adjusted so tight that I had to use a C-clamp to close them. So anyway, all the 'from bad to worse' bull**** seems to be over, but I have this thermostat housing cover that has a crack. It's odd to me that these two parts, the housing and the housing cover are not easier to find... with the perfect storm of dissimilar metals, and perhaps a bit of coolant seepage under the gaskets, this would be a part that has considerable demand. OTOH, perhaps that is precisely the reason they are unicorns. If anyone knows where I can find a cover I will buy the beers. Does anyone have a source for the thermostat housing cover for a 76 280z? .... It's odd to me that these two parts, the housing and the housing cover are not easier to find. 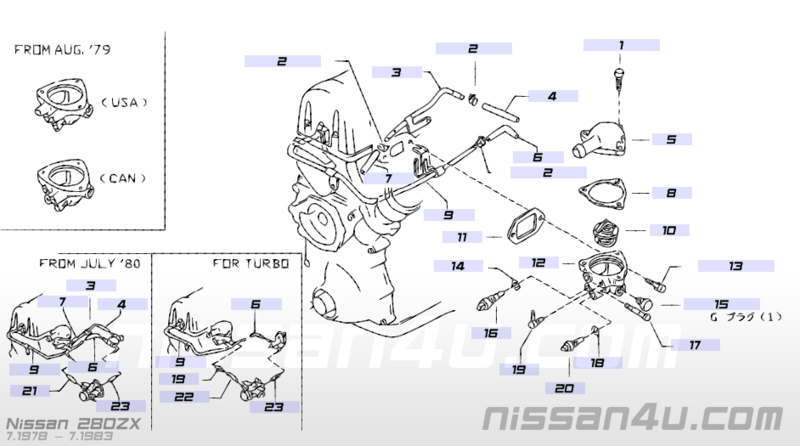 Nissan hasn't built the L28 in over 30 years, it's no surprise OEM parts are not available. Used or salvaged parts are your best hope. Try Ebay or Car-Part.com--Used Auto Parts Market . Several salvage yards on car-part.com listed housings available with toll-free numbers. You'll pay some shipping, but you'll get the parts you need. Nissan, or le junk yard. I believe I have a spare or two as well. it looks like this part on ebay will fit, but mine has three bolts (one unused). Not sure if the zx part will fit yet. Worst case, the crack is on the outside of the bolt hole, not the inside where the sealing surfaces are. Some JBWeld and creating use of a washer will probably get me back on track. In in Atlanta for a few days, will send you a shot when I get back home. Thermo-time, how does it work? What are all the sensors on front of thermo housing area? Need help with thermo sensors! !